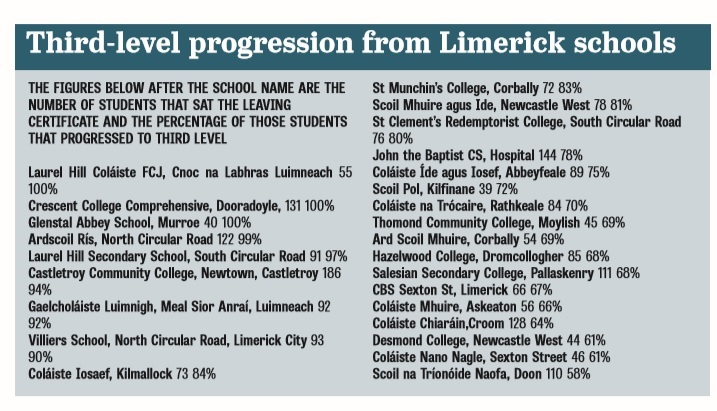 THREE Limerick schools have achieved a 100% rate of student progression from second-level to third-level education. The schools are Laurel Hill Coláiste FCJ which is based in the city centre, Crescent Comprehensive, which is located in Dooradoyle and Glenstal Abbey which is based in Murroe. These three schools saw every one one of their Leaving Certificate pupils’ progress to third-level education in Ireland. The figures are taken from nation-wide tables which were presented in the Irish Independent. They provide a break down of where pupils from the Leaving Certificate class of 2018 started college this autumn. The figures do not provide information on school leavers who pursued other forms of education, such as apprentices or post-Leaving-Cert (PLC) course. The figures must be treated with a certain amount of caution, as not all colleges provide information regarding new students in the same way. The figures were also presented this week in a number of national publications. The figures quoted here are based on what was presented in the Irish Independent. Figures published in other publications were slightly different as they included mature students, students who deferred and other information. The figures are based on data collected from most colleges in Ireland, as well as Queen’s University in Belfast and Ulster University. Figures are not recorded from students from the Republic of Ireland who have pursued third-level education in England, Wales or Scotland or elsewhere. The tables include data from the seven universities in Ireland (including UL), Royal College of Surgeons in Ireland (RCSI), Limerick Institute of Technology and the other 13 institutes of technology across the country, teacher training colleges, National College of Art and Design (NCAD) and St Angela’s College in Ireland. It also includes a number of private colleges, which include Griffith (which has a college in Limerick) and DBS. In well over 200 schools, over 80% of Leaving Certificate students are now progressing on to college, while more than 400 schools have a 70% progression rate into third level. Within the state-funded school sector, Irish speaking schools have a strong tradition of college progression. This was also evident this year.